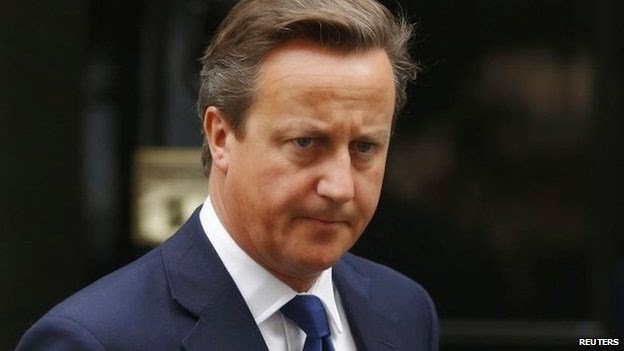 David Cameron is to abstain in a parliamentary vote on recognising Palestine as a state, the UK prime minister's spokesman has said. Labour MP Grahame Morris is presenting the motion, which has the backing of the Labour shadow cabinet, on Monday. The vote is symbolic and would not change government policy but could have international implications. In 2012 the UN General Assembly voted to upgrade the Palestinians' status to that of "non-member observer state". The assembly voted 138 to nine in favour, with 41 nations - including the UK - abstaining. Current UK government policy, as set out by former Foreign Secretary William Hague, is that it "reserves the right to recognise a Palestinian state bilaterally at the moment of our choosing and when it can best help bring about peace". Mr Morris's motion states that "this House believes that the government should recognise the state of Palestine alongside the state of Israel". The prime minister's official spokesman said: "The government's position is very clear and hasn't changed, so I think that is a very clear indication of the British government's approach. "The government's approach is a long-standing one and is in support of a two-state solution and we will continue to work with a range of international partners - Israel, the Palestinian Authority - in support of that." The BBC understands that a group of backbench MPs will attach an amendment to the motion on Monday, adding a clause with the words "as a contribution to securing a negotiated two-state solution". The vote comes amid moves elsewhere in Europe to recognise Palestinian statehood officially, more than 100 countries having done so. Israel says moves to recognise Palestine are premature and undermine efforts to reach a peace settlement between the two sides. Palestinian officials say they have been forced to pursue measures including seeking greater recognition internationally because a succession of peace talks has failed. Labour has twice called on the government - in 2011 and 2012 - to back Palestine's request for official state recognition at the UN. It is believed Conservative MPs will have a free vote on the motion and that it has the support of most Liberal Democrat MPs.